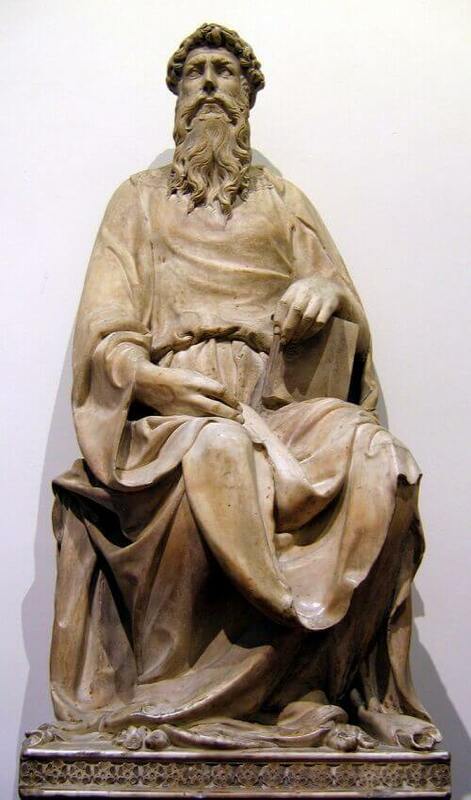 Donatello finished work on his statue of St. John the Evangelist between 1410-1411. The colossal marble piece was placed initially inside a niche of the Duomo in Florence. The statue was exceptionally well-received. It began a shift in the artistic climate away from Gothic Mannerism and towards naturalism. St. John the Evangelist is also one of Donatello's earlier works. It displays an unparalleled mastery of perspective. The statue was to be placed far above eye level. To correct the distortion that onlookers would observe from this angle Donatello extended the torso and shortened the legs of St. John. In Biblical history St. John was one of the original twelve apostles. He was considered a pillar of the church in Jerusalem after the death of Jesus. Donatello portrayed St. John as a noble and introspective prophet. He is seated in traditional flowing robes that hide his body but show off a gracefully sculpted arm and torso. Before the Renaissance John the Evangelist had usually been depicted has a young man. Donatello did not choose to create an idealized rendition of legend. He decided to show the wisdom of an aging prophet. His St. John has his hand placed carefully atop a book of scripture as his eyes seem to search for some deeper truth.